National Geographic ScienceBlogs: On the Back of an Envelope: That Glass of Water in a Restaurant? California, and much of the southwestern US, is in a severe drought. Again. And as appropriate, there is growing debate about what we, as citizens, communities, corporations, and governments should do to tackle water shortages and the bigger question of sustainable water policy. Suggestions range from the large-scale and comprehensive (build more dams, transfer more water from farther and farther away, rethink the entire agricultural sector, use high-quality treated wastewater to meet certain needs) to the small-scale and local (replace your lawns and inefficient water-using fixtures, stop washing your car, turn off the water when brushing your teeth). All of these things are worth considering; plenty of them are worth implementing. Mr. Cheadle’s tweet [I know society thinks using first names of famous people is ok, but I’m not going to presume…] produced a range of responses, including several from people who felt that this recommendation was a tiny and insubstantial gesture, or a “first world problem,” or didn’t understand why this might help a water problem as severe as we’re experiencing. The Pacific Institute has done extensive and groundbreaking research over the past 25 years on a wide range of water, climate, energy, and environmental issues. A major focus of our work has been on how to use water more efficiently to do the things we want to do – a focus on “efficiency” and “productivity” – not deprivation. Our research has shown that we can save vast amounts of water in both agriculturaland urban settings without hurting our economy or lifestyle. But behavior, information, cultural factors, and education also play a role in our water use. We could certainly have nice lawns while still using less water, but we could also get rid of our lawns and still have beautiful water-efficient gardens. We can have clean teeth and still turn off the water while we’re brushing. All of these things help individuals and groups change behavior. Think about smoking: We made cigarettes expensive by taxing them to fund health and other programs, made public spaces off limits to second-hand smoke, and launched a massive public education campaign about the health dangers of smoking. These actions have been very effective at changing perceptions, preferences, and public behavior. Even those who still smoke now wouldn’t think of lighting up in an airplane, school room, or restaurant. In the water world, if our choices and decisions and behaviors change in the direction of lower-water-using options, so much the better. The average American eats at a restaurant five time a week. 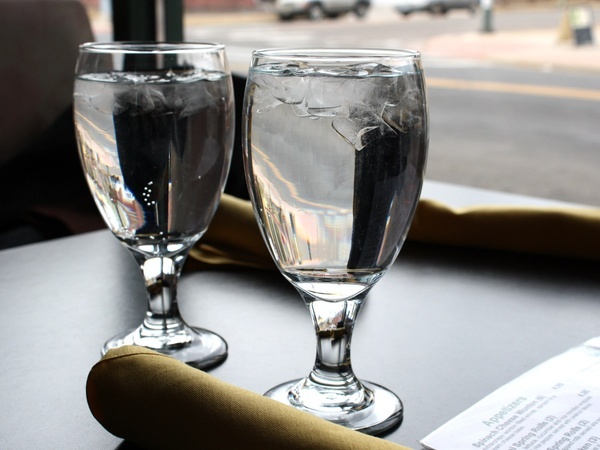 Water is automatically delivered to your table by the wait staff. At the end of the meal, a half a glass of water (6 ounces) is left, undrunk. Commercial dishwashers use a wide range of water, but average around 4 gallons of water per rack, and a rack holds around 20 glasses. Under these assumptions, the total amount of water that could be saved nationwide is around 20 billion gallons of water a year. To use the silly but ubiquitous standard measure: this amount of water would fill 31,000 Olympic-sized swimming pools. These savings are real: This is water someone won’t have to pay for, the water utility won’t have to collect, treat, and pump to you, and the wastewater utility won’t have to collect, treat, and throw away. And there are energy and ultimately climate costs as well to get that highly treated potable water to you, to wash the dishes, and so on. In context, it is true that far, far more water could be saved by improving irrigation efficiency in the farm sector, or getting rid of our lawns, or replacing inefficient washing machines. We should do those things too – it is not one or the other. But we must not ignore the power of even modest individual actions, the educational value of raising awareness of the value and scarcity of water, and the importance of exploring all the options available to us. You make an interesting point! I was just at a restaurant this weekend that only brings water on request, so this was a timely post. I also wonder, is an online survey representative of the millions of Americans who can’t afford to partake in far fewer opportunities to eat at sit-down diners/restaurants? I would doubt it. Anyway, interesting point anyway. Thank you for pointing out that small habits do matter. It is also about getting water conservation on peoples radar. If you politely ask your waiter to not bring water to the table, your waiter might think twice about running the water while brushing his/her teeth that night! The people sitting next to you might do the same! Not one of the various postings I’ve come across are like this one. You are able to tell alot of work went into this. Now i’m actually glad I came across this posting. It’s well written plus the information is excellent. I hope to find more like this. This is a carefully constructed post. It’s creatively written and very informative. If only other blog writers could provide submissions this great. Keep up the great work. Judging by the amount of comments, this is undeniably a very involved subject. Whenever I revisit this post there’s an interesting guest post better than some of the prior ones. This content is quite involving. I may definately be returning your blog. Very good material compared to many of the similar posts I’ve checked out. Continue the nice work. Awesome content. I wish all information We’ve came across was this good. Keep up the nice job. This is what I call awesome information. Continue the good work. Based on the number of comments, this is undeniably an extremely engaged topic. Everytime I revisit this post there’s an interesting guest post better than many of the earlier ones. It is obvious that this blog post is among the finest I’ve found today. It’s also evident the person who’s website this is put alot of work into it. Great work! It’s just so refreshing to discover good content like this with all the irrelevant content that’s out there. After all, you can just tell that alot of time and patience with into this. Do you use content writers or do you create your own content?